LaCrosse Footwear has been at it for over a hundred and ten years. Their line of recreational and work-boots is large and diverse. The outdoor boot segment is smaller than the industrial and work-place boot market, yet at an estimated sales of one billion dollars per year, it is far from trivial. LaCrosse has taken a keen interest in satisfying hunters. This was made clear by their presence at the 2010 Shot Show in Las Vegas alongside such familiar and trusted names as Browning, Bushnell and Winchester. What LaCrosse has done over the years is to keep abreast of current technologies and formulations in their neoprene boot line. This is obvious from the LaCrosse Alpha Lite RTG APG 18 inch Style #200500 waterproof boots I've been wearing of late. Neoprene itself can be an effective insulator, as I can tell you from my scuba-diving experience in cold Illinois and Wisconsin quarries. Cheap neoprene can also be stiff and unforgiving. As a person quite gifted at stepping into water that was supposed to be shallow, but was not, hunting most of the day with boots that are wet on the inside is not pleasant. Boots that don't properly conform to your ankle and leg are easy to step out of and I've "experimented" with various techniques for doing that in the field, as well. Not exactly intentionally, but I'm well-experienced with the phenomenon. Alpha Lite boots softly grip the ankle area and aren't boots you'll likely step out of. The material has plenty of give and flex. My boot size varies by manufacturer (same with shirts and just about everything else), but in general I'll wear a size 9-1/2 standard boot and take a 10 or 11 in a hunting or work boot. Though not gloves, these boots fit me like them. With the cam-loc buckle in back of them, they are versatile as to both initial fit and the socks (or pants) you use them with. LaCrosse reevaluates and redesigns their hunting line on a regular basis, as new formulations and manufacturing techniques become available. This is evidenced by their newest Alpha SST line, that seeks to take scent-free technology to a new level. In the case of these Alpha Lites, the folks at LaCrosse took a look at reprofiling the sole area to eliminate the superfluous areas that had no bearing on strength or durability. By retooling and reprofiling, they were able to reduce the weight with no loss of toughness, but increasing the comfort level with every step you take. I compared these Alpha Lites to a set of generic full size rubber boots I have of the same basic envelope dimensions and sure enough, the pair of Alpha Lites weighed in at about half of a pound less. 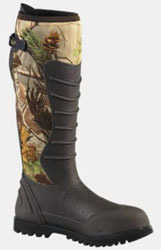 Those looking for extremely cold condition, more or less stationary use would likely care less, opting for thinsulate lined, thicker options that LaCrosse offers, while those that don't "step into it" as deeply as I do might consider the 12 inch tall version of this same boot for less weight. For general use, I think the Alpha Lites are ideal. For some hunts, leather boots are generally an option to avoid and these examples will do the trick. Many folks that have the preconceived notion that rubber boots are heavy, uncomfortable and prone to chaffing your calves will be quite surprised after trying out Alpha Lites. They are easy to get in and out of and you'll never have to bother tying a shoelace with them. These boots currently go for one hundred bucks delivered to your door from www.lacrossefootwear.com, or see your local LaCrosse dealer. I'm quite happy to be able to recommend them.